Middle School math teacher Liz Caffrey was among the presenters at the Progressive Education Network (PEN) National Conference, held Oct. 6-7 in Boston. 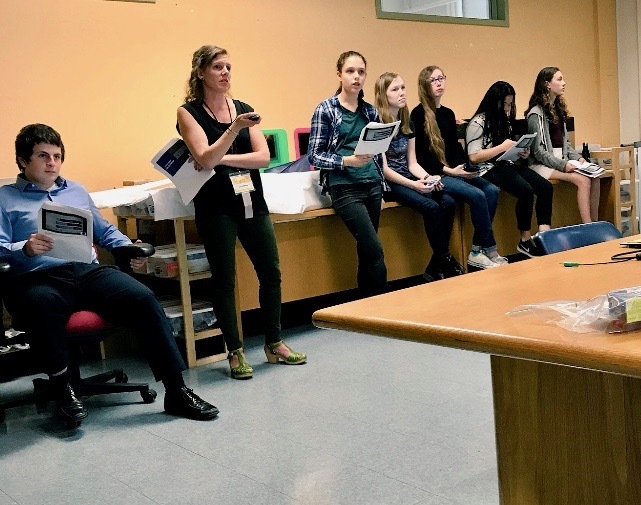 Liz’s presentation, “Walking in Another’s Shoes: Two Middle School Math Projects About Social Justice,” was a discussion of two classroom projects she has done in the past two years. Eight students accompanied her to the conference to assist with the presentation and answer questions from attendees. This year’s project made each student a financial advisor by assigning them a client from a specific demographic, for whom they had to manage finances, do taxes, and find housing. Last year’s project involved mining data from the U.S. Census to see how the election would end if only specific demographics voted. For the financial advisor project, students were assigned clients from specific income-based race, gender, and educational demographics. With such insight into the clients’ backgrounds and histories, students are better able to understand their clients’ lives while learning important skills like budgeting. Last year’s project had students researching the percentage of voters over 18 years old, the percentage of American citizens, and the breakdown of Massachusetts voters casting ballots for each party. After the election, the students discovered the polling data was wrong, which was an important lesson from a mathematics standpoint, teaching them that predictions and statistics are not infallible. During the PEN Conference, Atrium also hosted more than 20 educators from around the world. Educators from places as diverse as Finland, Washington state, Los Angeles, and Washington DC visited Atrium on Oct. 5, spending the day in the School’s classrooms and meeting with faculty. PEN conference attendees visiting Atrium also received a learning tour of Mt. Auburn Cemetery from second grade teacher Jill Ferraresso.